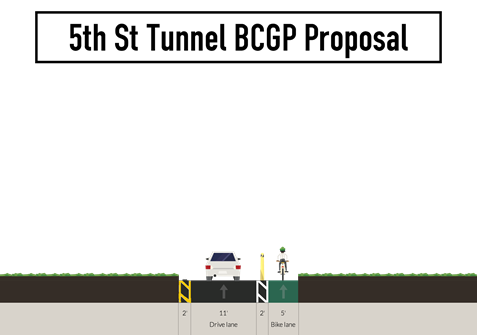 A Protected Lane in the 5th Street Tunnel? Earlier this year, some of our friends on social media brought a concern to our attention: The 5th Street Tunnel is dark, scary, and the standard bike lane is potentially dangerous. And was there anything the Bicycle Coalition could do about it? The tunnel, a 1,200-foot roadway that connects vehicles between Race and Callowhill and bypasses the Ben Franklin Bridge has been called an “urban rollercoaster” and “magic” by at least one Philly Love Noter (note: this is not untrue); it’s a yearly stopping point during the Philadelphia Naked Bike Ride; but for cyclists whose main concern is safety, it’s a dark, potentially dangerous hill without proper precautions. A change to the tunnel is something the Bicycle Coalition has long been advocating for, and with the help of some fellow cyclists and the city, it looks like the project will soon be done. After speaking with our friends on social media, including Sarah Hirschler, Bicycle Coalition research director John Boyle got in touch with the Streets Department and the Delaware River Port Authority, which is in charge of the tunnel. (The Streets Dept. manages the road surface). 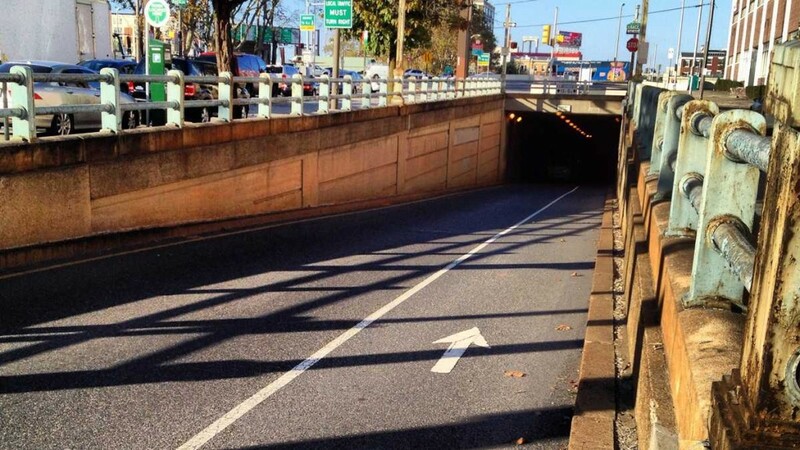 At a meeting between our organizations, and in additional conversations with the Streets Department and the DRPA, we suggested Streets install a buffered bike lane with bollards to better separate bicycles from motor vehicles using the tunnel. More information on this as the project moves forward. One minor concern with bollards is how the bike lane will get plowed in the winter. Currently, in the winter, the Streets Department often plows “part” of the bike lane only because they run the plow down the middle. Obviously, this is not an issue in the tunnel proper, but the entrance ramp and exit (which is more an uncovered trench than a tunnel) are areas of concern. And yes – I ride this tunnel almost daily, year round. This is a great step forward for bike infrastructure. Protected bike lanes are the way to go. Way to pick off this low-hanging fruit. Hopefully it will lead to additional protected connections to this stretch, and more implementations around the city.